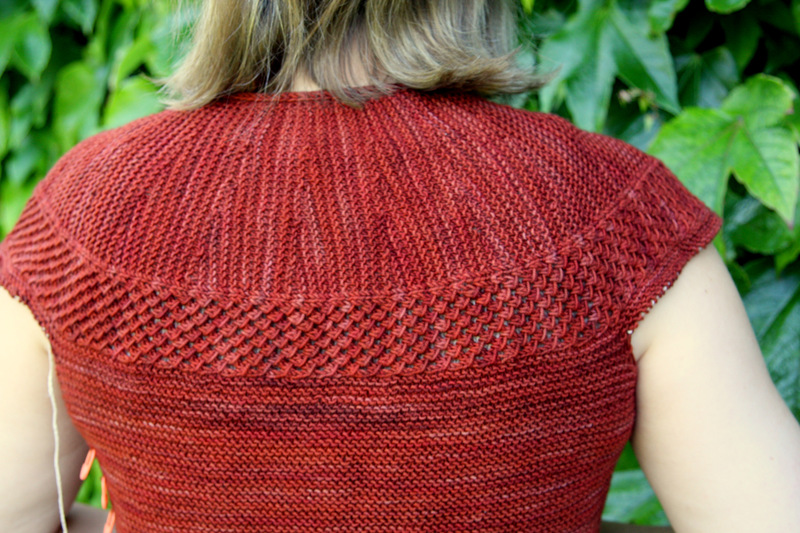 Some of you may think that my last several posts have been about copyright issues, badly behaving designers, gorgeous designs, and things my mother and grandmother knit, in order to cover up for the fact that I haven’t been doing any knitting. Well, dear reader, you would be wrong. 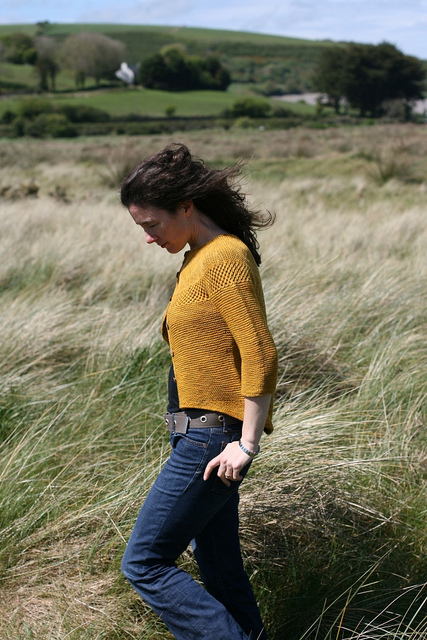 I have been plodding away on two cardigans, my Ravi cardigan and the Killybegs cardigan, both coincidentally designed by Carol Feller. I haven’t been able to get any photos taken until today however. 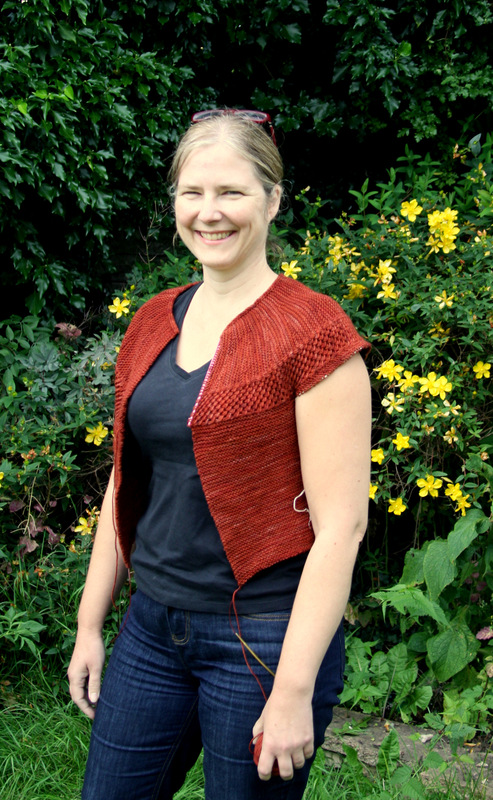 In Ravi, as you may recall, the yoke, including the lace panel, is knit from side to side and then stitches are picked up all around the yoke (about 200 of them) and the body is knit down in garter stitch. I worked very hard to pick up the stitches as carefully and beautifully as possible and I must say I am quite pleased with the results. See the pick-up line in the photo below and how even every stitch is? It can be very hard to pick up evenly around an edge, particularly a long one. Many times I have to rip and start over. This one came out perfectly, without any ripping at all, but mostly because I took my time and did it very meticulously. It took over three hours just to pick up the edge. In addition to the yoke design, Ravi has an interesting construction at the base. The body is knit down to the waist, and then there is a bunch of short row shaping on the back of the cardigan, so that the front actually ends quite high up, at the natural waist really, and the back curves down over the hips. Here is a shot of Carol, from the pattern. It’s not the best shot for showing this feature, but you can see that the front of the sweater comes to above her belt line, while the back is a good 4 inches lower. Now, I have actually knit down to where I should start the short row shaping, which effectively means that the sweater will not be any longer than it is now in the front. I am worried that this is actually too short and I should add a few more inches. On the other hand, I really like this feature of Ravi, and like the way the swoop in the back looks. If it was placed too low on the hips, I don’t think it would have the same nice effect. So, I have a bit of a dilemma; keep it really short in the front, or do some lengthening, which may cover up some pudginess at the waist line but possibly contort the nice line of the back? If I do make it longer, I will have to add in some hip increases. In any case, I need to decide now, before I knit any further. Any suggestions? Ravi, as you may recall, is being released in segments as part of a giant KAL organized by Carol Feller. 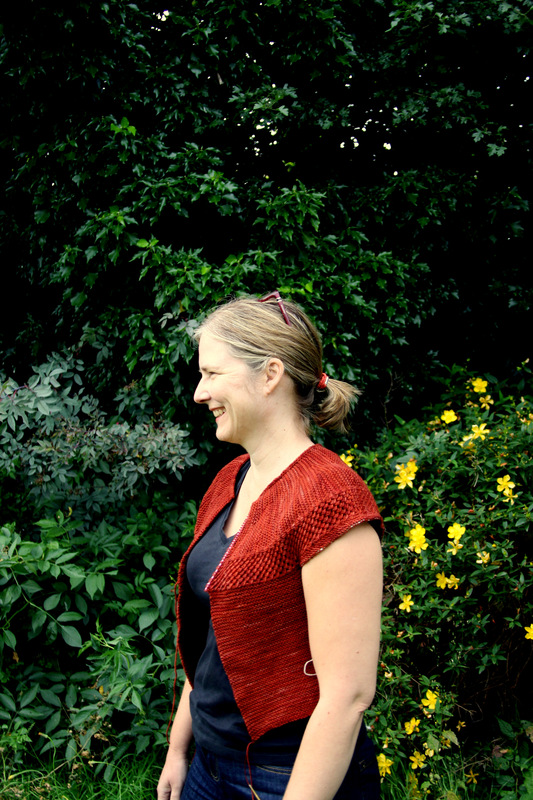 There are currently 891 members of the Ravi KAL group on Ravelry. That is an awful lot of people following along and knitting this project together. One would think that that would generate a lot of extra enthusiasm for this project (in me, I mean). I find, however, that I am something of an anti-populist in these things; I tend to like patterns better when they aren’t insanely popular. It’s sort of like books – if something has reached the bestseller lists, I feel almost honor-bound to ignore it. The fact is I have a lot of enthusism for the pattern; I think it is a lovely design and very well executed, and the project notes that accompany each segment are great. When I started out, I found the KAL forum very useful for deciding on which yarn to use, and which short row method to use, and just looking at other knitter’s progress was fun. But I notice that, as of this morning, there are 1884 posts on the forum which I have not read. In addition to Ravi, I have picked up Killybegs again. 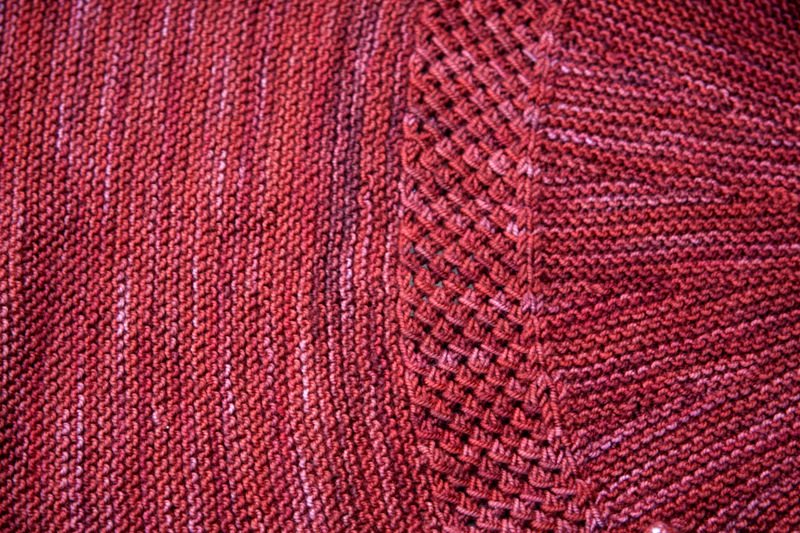 I had previously knit the body of the sweater up to where the yoke begins. 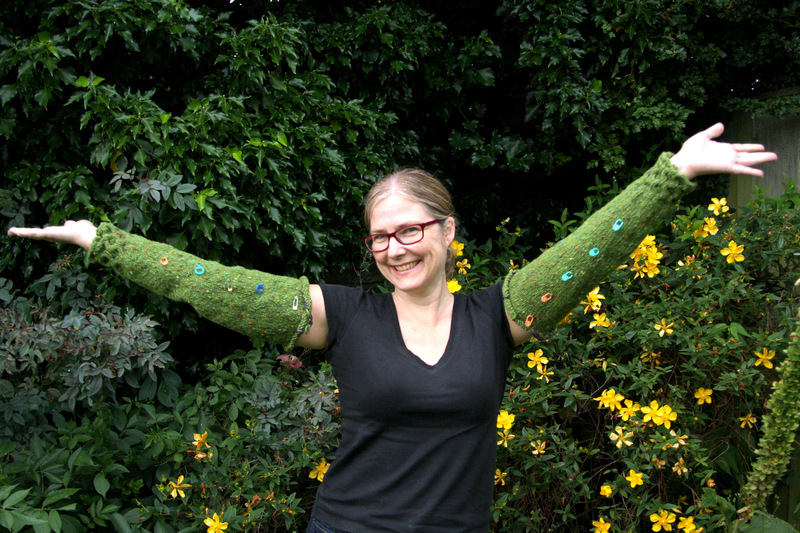 In the past two weeks, I have knit both sleeves. 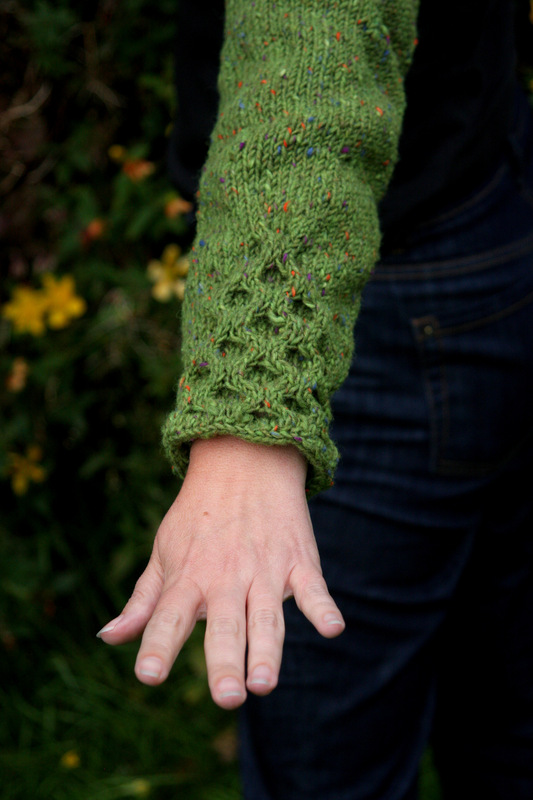 The sleeves are knit on DPNs (double pointed needles). Knitting on big, fat, wooden DPNs (US size 9), with thick wool, while cabling, is not easy on the hands. I had to limit how much I knit each day as I found my wrists and thumbs would really start to ache after an hour or so. 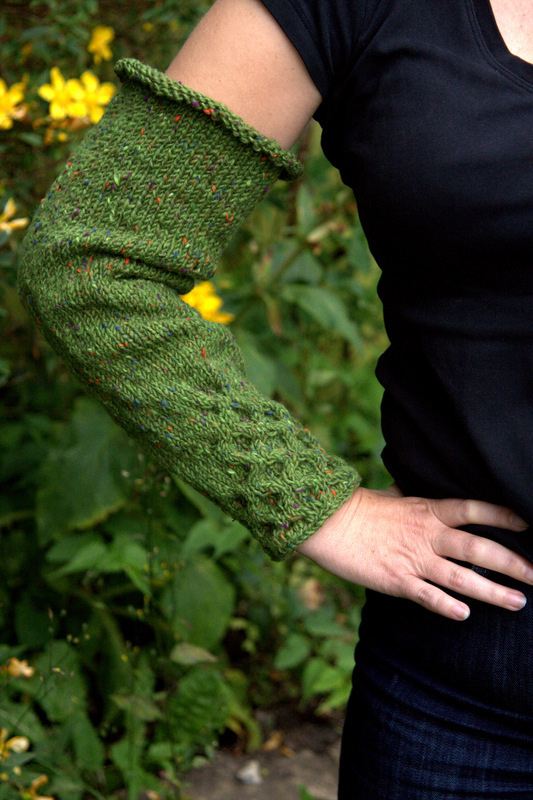 But now the sleeves are done and I am ready to join up the sleeves with the body and commence the yoke. That will be a bit of a challenge, as there will be a huge number of stitches on the needle, and lots of cabling. On the other hand, just finishing the sleeves gives me a huge psychological boost. And this incredibly vibrant green, with all of the cheery flecks of orange and purple (Studio Donegal Aran Tweed in “Green”), makes me happy. I can’t help but smile when I’m knitting with it. This entry was posted in Main and tagged Carol Feller, Donegal Aran Tweed, KAL, Killybegs, Knitting, Ravi by knitigatingcircumstances. Bookmark the permalink. My opinion- I would make the front of the sweater a bit longer. 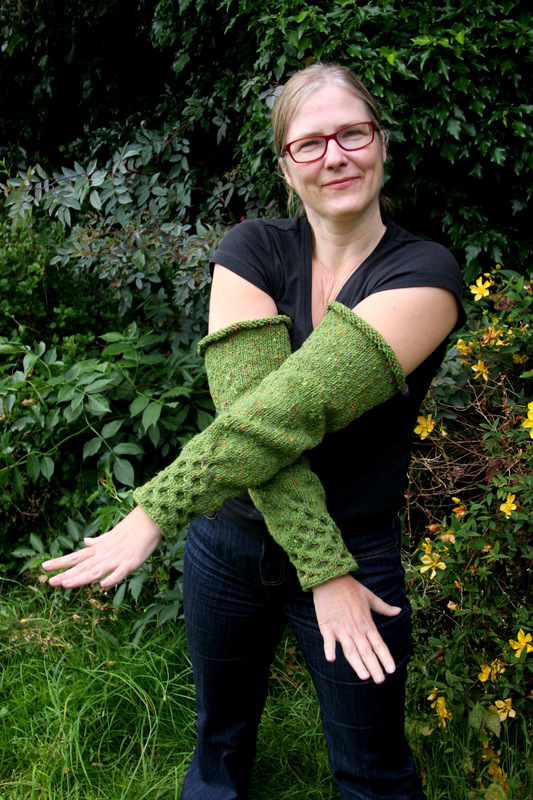 And I love the green sleeves! Looking at the designer’s photo, the sweater does fall inches lower (looks like at the top of the pelvic bone) than yours does now, so I would make it longer. You may have to compensate for that change at the back but it will fall better (and give that slimming diagonal effect) if you start with the front a bit longer. I can’t tell that well from the photos but you don’t look any more long waisted than the model does. Funny, hunh? P.S. Afterthought: Have you also tried fastening yours at the front before deciding? Hi Teresa, Yes, I think that you (and Jossie too) are probably right. Now that I look more carefully at the photos, I think it definitely needs a bit more length. I’ll probably take it with me to Vancouver next week, so you can give me advice in person!